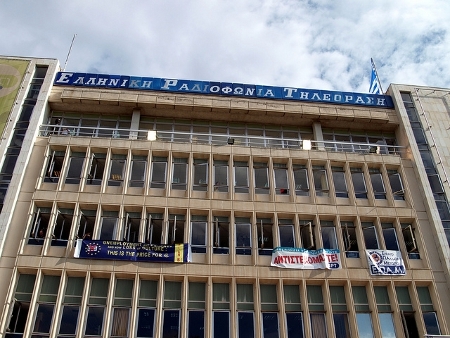 The problems faced by Greece’s public sector are such that the sudden closure of ERT may have been the least bad option. Last week, with almost no warning, the Greek government closed the national broadcaster, ERT, putting over 2,700 jobs at risk. Kevin Featherstone argues that while the way the announcement was made raised justifiable concerns, the central objective should be broadly welcomed. The case typifies the problems in achieving serious public sector reform: indeed, it may be the only way to unblock such an agenda. Last week’s dramatic decision to close down Greece’s state broadcaster, ERT answers a question Greece’s political leaders – in and out of government – have lacked the will to confront for a generation. At one level, the move is gesture politics: a sudden, unilateral act intended to impress the Troika (the EU, IMF and the European Central Bank), after the sale of natural gas firm DEPA was messed up. The audacity of the move provoked the predictable protests – attacking the media gets headlines around the world. But the protests have a valid point about such a ‘shock and awe’ announcement: it comes without proper consultation, no parliamentary approval and with no fully-worked out plan. There is also a very legitimate concern from this initiative about democracy and the importance of public sector broadcasting. True, over its history, ERT has hardly upheld the highest standards of political independence or of programme quality. Successive governments have staffed it with their trusted lieutenants. I also remember ERT TV newsreaders in the 1980s struggling to read from the text of the new ‘tele-prompter’ technology – introduced into Greece years after the rest of Europe – rather than from the paper on their desks. The newsreaders’ eyes looked transfixed, as if they were no longer allowed to blink, and the viewer was left unsettled as to what these ‘robots’ might say next. But, a market-economy with no public sector broadcaster risks distorting national debate and undermining the ‘public good’. Ultimately, the argument for ERT is the same as for the UK’s BBC, whatever the differences in quality. Some of Greece’s private channels today hardly offer reassurance against the risks of cheap, sensational journalism without regard for the public interest or of following their own company bias. There is an even bigger and deeper issue raised by the ERT move, however. It is one that politicians across the spectrum ought to focus on. With a recognition that the state needs to be an active supplier of important public services, how do you fix its organisations when they become dysfunctional? In Greece, everyone would accept that ERT has been badly mismanaged for years. It’s not only a matter of political cronyism: it’s also the evidence of the gross misuse of resources, the overstaffing, and the Byzantine accountancy systems. These weaknesses have been tolerated for far too long – as an indulgence of an old-style politics that undermines Greece. The ‘gold-standard’ would be to have a process of reform that was inclusive and well-informed to produce a blueprint for the re-modelling of those parts of the public sector in greatest need of modernisation. But such reform has been off-limits: union power and electoral interests made it a taboo until the arrival of the Troika. Four years into Greece’s greatest peace-time economic crisis in living memory, still there is precious little progress with the agenda of reforming the state administration or even the wider public sector. With the state machine not delivering reform and politicians defending every last public sector job, the Troika insists on crude, painful horizontal cuts. Politicians object, the Troika leaves town, they return and the crass austerity continues. All the while, the serious question of re-modelling is obscured. Against this background, a sudden announcement to close ERT is more understandable. It partially emulates the tactic adopted with the old Olympic Airways: close it down and start again with another, slimmer company. Potentially, it’s a strategy that could be applied to other parts of the public sector – as an answer to an almost impossible task. The end-result may be the best solution for ERT. Yet, the example of Olympic offers warnings for the wider public sector. After it was re-structured and sold-off, Olympic still proved economically weak, as the take-over bid from Aegean indicates. There is a separate lesson here, therefore: the re-structuring of public enterprises cannot ignore the priority of operational viability. The ERT case tells us all we really need to know about the problems of the public sector in Greece. With serious planning and inclusivity blocked off, a dramatic gesture is made that is wanting in process but possibly provides the least-bad solution. If the initiative totally collapses, what then for the reform of the public sector? Please note that as of Tuesday, 18 June, a Greek court has ruled that ERT can resume its transmissions. *NOTE: This piece has also been published at the Greece@LSE blog.The article was originally published as an Op-Ed in the ‘Kathimerini’ newspaper, Greece, 16th June 2013. Note: This article gives the views of the author, and not the position of the British Politics and Policy blog, nor of the London School of Economics. Professor Kevin Featherstone is the Eleftherios Venizelos Professor of Contemporary Greek Studies and Director of the Hellenic Observatory in the European Institute. His research has focused on the politics of the European Union and the politics of contemporary Greece; his work has been framed in the perspectives of comparative politics, public policy, political economy and processes of ‘Europeanization’. His most recent books are (co-authored with D. Papadimitriou, A. Mamarelis and G. Niarchos) The Last Ottomans: The Muslim Minority of Greece 1940-1949 (Palgrave Macmillan Publishers, 2011), and (co-authored with D. Papadimitriou) The Limits of Europeanization: Reform Capacity and Policy Conflict in Greece (Palgrave, 2008).